Steve Martin double bill. In 'Father of the Bride', doting father George Banks' (Martin) world comes tumbling down around his ears when daughter Annie (Kimberly Williams) announces her engagement to boyfriend Bryan. Although initially unable to cope with the thought of his little girl going away and leaving him, George soon sets about making sure that Annie's is the perfect wedding - but it isn't long before the strain begins to take its toll! 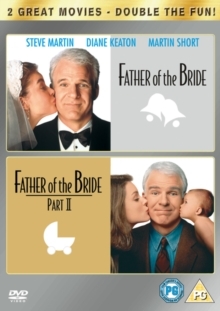 In the sequel 'Father of the Bride - Part 2', George Banks has now reconciled himself to the fact that Annie is a happily married young woman, but when she informs him that she and Bryan are expecting a baby, a mid-life crisis is triggered off.